For many mothers our first period is a distant memory. Twenty or thirty years may have passed since our fertility began. We should keep in mind that something now so familiar to us, is something totally new and uncharted (no pun intended) for our daughters. Let’s help prepare them for their first period before it happens, if at all possible. Doing so will make the experience less scary or shocking than it may be otherwise, and will open up lines of communication regarding health, fertility, and reproduction. So what should we make sure our daughter know before their first period arrives? While we can’t tell our daughters exactly when their first period will arrive, we can give them a heads up. We can share signs that they may experience like breast tenderness, pubic and underarm hair growth, cervical mucus, widening hips. Share with your daughter what age you were when you began menstruation - it is likely that her timing will be similar. It is normal and healthy to have a regular period or menses, and is a sign that all is well with her reproductive system. Share with your daughter that sometimes it takes a while for cycles to normalize, but that she should expect a flow of about 3-7 days. It may begin heavy and get progressively lighter, or it may start out light and get heavier and then get lighter again. An extremely heavy flow (requiring a change of hygiene product more than every 1 -2 hours) is not normal. Some slight discomfort may be normal, but severe pain that impacts her ability to function, is not. By simply starting a dialogue you are signaling to your daughter that you want to help guide her through puberty, and beyond. You will likely also want to explicitly tell her that you want her to come to you when she has questions, and that you are happy to help. By doing the above you give your daughter a safe space to find answers to her questions. While Google and all it offers has revolutionized how we look for and find information, there are some topics that are better not searched for on the internet, especially when our children are relatively young and may not be able to avoid topics and images that are meant for older audiences. Let her know that she can always come to you for answers, and if needed, you can find them together. Thank you for requesting more information & updates! We hope to serve you well. Why isn’t the basic language of fertility taught? Why are grown women left with a fraction of the knowledge they should have to make informed decisions? It is likely, that far too few women have this basic knowledge themselves and were (and still are) unable to share it with their daughters and granddaughters. We want to change that. We believe that having a basic, working knowledge of female health and fertility is a something all young women should have. Let’s equip ourselves with the knowledge and facts so that we are able to make informed decisions, and are ready share and empower future generations. If you want information and resources, check back often, or sign up for our updates to make sure you don’t miss anything. Nourishing yourself in a way that helps you blossom in the direction you want to go is attainable, and you are worth the effort. A 3 month guide to self-care and improved fertility. When working with clients who are trying to conceive, I try to support them in making changes that encourage optimal fertility. One of those changes is reducing foods that are known to cause inflammation. While every body is different, there are three main foods that are known to be inflammatory - these include gluten, dairy, and sugar. Removing these foods can make a significant difference in how your body functions and how you feel. It is often best to ease into removing these foods, so you may want to consider a month or two to develop new habits, find resources, and figure out what works and what doesn’t. During this time, aim for 90%, and then later you may decide to take a few months where you are avoiding these foods 100% of the time. Do it with a buddy - ideally your spouse, but a friend or another family member will help provide accountability and encouragement. Focus on what you can eat! There are so many tasty, nutrient dense vegetables. Fill your plate with them, and add in healthy fats, proteins, and fruits. You may want to begin during a time when you don’t have any major changes, travel, or other stressors going on, but don’t feel like you have to wait until the perfect moment. Reducing gluten, dairy, and processed sugars does not mean you have to go low carb. Listen to your body. You may want to add in gluten free grains, such as buckwheat, rice, and quinoa, but you should definitely ensure that you are consuming some starchy vegetables - roots vegetables, such as sweet potatoes, beets, carrots, and also squashes, such as butternut and other winter and summer squash. Take a deep breath or two before you begin to eat. This will signal your body shift into rest and digest mode. And if you are feeling uninspired or craving an old favorite? Pinterest is your friend! Simply type in paleo, AIP, Whole30, or GAPS into the search engine and peruse options. Or if you want to recreate a specific recipe or style of food, type in what you are hoping to find and add one of the key words. For example, “paleo pasta” or “whole30 pad thai” and find something that appeals to you. And finally, be gentle with yourself and enjoy the process! Happy Natural Family Planning Week! Below are links to stories we shared with a fellow FertilityCare Practitioner, Holly Baril, on why we chart using the Creighton Model, and why we decides to become practitioners. To learn more about charting with a mucus based method, the Creighton Model, and NaProTechnology you can listen to the podcast at Fertility Friday. What is different about the Creighton method of fertility awareness charting? 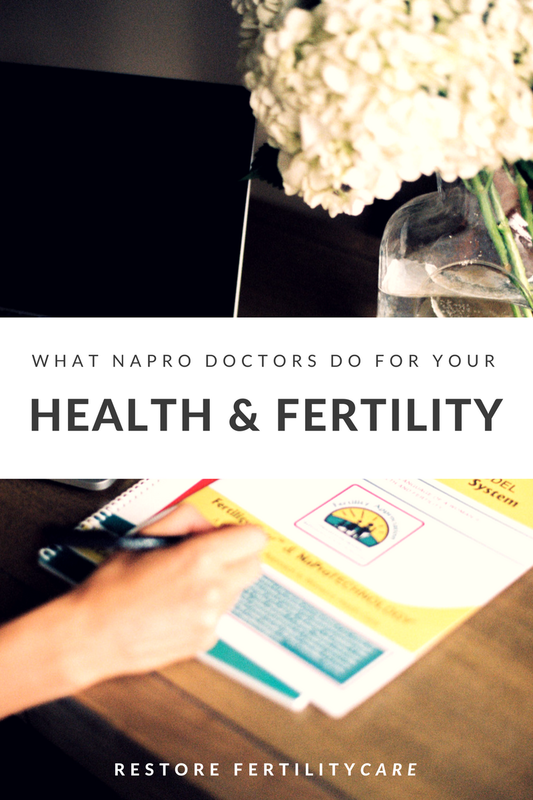 How do FertilityCare Practitioners and NaPro Doctors work together to interpret a woman’s charts and address any cycle irregularities? How is the Creighton model effective, especially considering that it is a mucus-only method of charting? How does mucus production shift around ovulation? When might observing temperature not actually be helpful? Is all mucus fertile? How do you tell when you are fertile? How do models like Creighton and Justisse classify “sticky” and “tacky” mucus? What does a healthy menstrual cycle look like? Are NaPro Doctors “medical” or are they “holistic”? How is the approach that NaPro Doctors take different to mainstream physicians? Bisephenol A (BPA) is a synthetic chemical used in to make polycarbonate plastic and epoxy resins. BPA is also an endocrine disruptor that mimics estrogen and has been linked to many health concerns, including Infertility. Despite hundreds of studies demonstrating that even limited exposure to BPA can cause drastic adverse effects on our health, the FDA has yet to limit or ban the use of BPA in consumer products. The CDC found BPA in 93% of adults and children tested in 2003-04. If you are trying to conceive you will want to be especially aware of limiting BPA exposure. In 2012 Harvard School of Public Health conducted a study of women undergoing In Vitro Fertilization that confirmed that women with higher BPA levels had fewer eggs retrieved, a lower number of eggs fertilized and a higher implant failure rate. Additional studies have shown these same results. Store and heat food in glass, metal, ceramic, or paper containers. Once polycarbonate plastic is damaged through heat, harsh cleaners or age it can leach BPA into food that it comes into contact with. Replace your drip coffee maker with a french press. In a traditional drip coffee maker, hot water is constantly coming into contact with the plastic inside the machine and BPA can leach into the water. With a french press, the water only comes into contact with glass and metal. Choose glass, stainless steel or BPA free water bottles. Avoid using canned goods. This is a tough one, but when possible choose an item that comes fresh or packaged in a glass jar. Unless the can states BPA free, it most likely has an epoxy resin lining that is made with BPA and can leach into the product. Reduce skin exposure to receipts. Thermal paper is coated with BPA and when transferred onto your fingers, can absorb into your skin. Those who must handle thermal paper receipts for work are most affected. Handle receipts as little as possible and wash your hands after exposure. Prepare fresh meals at home. Meals served at restaurants, processed and pre-packaged convenience foods tend to have higher levels of BPA. Though completely eliminating exposure to BPA is impossible, you can greatly reduce the amount of BPA that makes it into your system by making lifestyle and product changes. Your body will thank you! By now, we all know that leafy greens are one of the best food groups for overall health. Leafy greens are especially important for women and men during the pre conception time period, as they are high in folate, which is critical in preventing birth defects. In addition to folate, leafy greens also contain other critical nutrients, such as calcium and iron, among others. Ideally we would all be eating a few servings of greens a day, but they can be hard to get in. When planning to conceive, set a goal of 2- 3 servings each day. Below are some ways to reach this goal. This could be a big, meal sized salad at lunch or dinner, or side salad, but get into the habit of having enjoying a salad each day at a regular time. Soon you will be looking forward to your daily dose of greens. When appropriate, wash the greens, so that they are ready to go at a moment's notice. Heartier greens can even be cut up. Now all you have to do is look for an opportunity to add them in to whatever you are making. A daily juice or smoothie is a great way to pack in nutrients. Depending on the size, it can replace a meal, supplement a meal, or make a portable snack. We also enjoy making our greens into dips, spreads, and sauces. This swiss chard pesto is a favorite. If you are sautéing (almost anything) you can usually add a green at the end with success. Shrimp? Add thinly chopped spinach. Veggies for an omelet or frittata? Chopped kale or chard (with the large stalks removed). Stir-fying? Throw in some bok choy! Earlier this year, we held a webinar to share some insight into the NaPro process for evaluating and treating infertility. To view the webinar, you may to use Chrome or Firefox for your browser.